Thaman needs no introduction. He has been delivering super hits to south Indian stars for more than 7 years now. 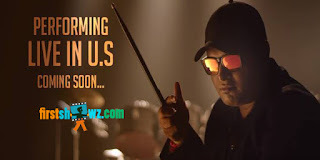 After delivering a chart-busting album with 'Sarrainodu', Super Sensational Thaman is embarking on a tour of the US, to entertain movie lovers with his pulsating beats and energetic performances. The tour will start off in Charlotte on April 30th and Thaman will be traveling to 9 US cities. Tickets for the show are available at sulekha at http://events.sulekha.com/ss-thaman_tickets_artist_110 as well as local cultural associations. Along with many renowned singers, Thaman is also going to bring some surprise celebrity guests for the shows. Come and join Thaman and his band, as they entertain you and your family over a fun filled night by bringing alive sound tracks from blockbusters like 'Sarrainodu', 'Dookudu', 'Kick', 'Brindavanam', 'Businessman', 'Mirapakai', 'Naayak', 'Race Gurram', 'Baadshah' and many more.